This book is for all those who desire to better understand the universe and their role in it, and especially for those who want to make a difference in our planet's future. It is written in nontechnical language for students whose careers will probably lie outside the sciences, but it is also for scientists and others striving to understand nature's ways and her connections to our lives. Thus, this is not a watered-down version of the standard physics textbooks for scientists. It presents physics as a human endeavor in its full philosophical and social context. Many groups' have recommended new approaches to science education and science literacy. This book reflects these recommendations in several ways: Scientific literacy.This book addresses the values, philosophical meaning, and societal impact of science, and stresses the scientific approach to knowledge. Modern view of the universe.Fully half of this book is devoted to relativity, quantum theory, nuclear physics, quantum fields, and other post-Newtonian and contemporary topics. Societal connections.This book includes such physics-related societal topics as ozone depletion, global warming, technological risk, energy resources, nuclear power, nuclear weapons, and pseudoscience. Interactive learning.Research in physics education has shown the importance of interactive engagement in student learning. This book engages students through frequent quick "Concept Checks" within each chapter, "How Do We Know?" subsections, a choice of topics that is relevant to student needs and interests, and a style that focuses on understanding rather than technicalities. A conceptual approach, with appropriate quantitative skills.Physics education research has shown the importance of explicitly focusing on the meaning of physics. For nonscientists, there is no need to learn algebra-based problem-solving techniques. On the other hand, quantitative measurement and tools such as graphs, probabilities, estimates, and powers of 10 are important for everyone. Thus the text is conceptual and numerate, but nonalgebraic. Algebra-based problems are, however, included in most chapters for those classes in which they are appropriate. Less is more.This book presents most of the great ideas of physics, but omits many "classical" topics normally included in introductory courses. Many studies have found that it is a mistake to present all of the traditional topics in one course. Depth is preferable to encyclopedic breadth, especially if the course is to move beyond nineteenth-century physics. Unifying themes.Four recurrent story lines, discussed below, unify the presentation and represent the book's pedagogical goals. The first and foremost story line ishow we know in science.Science is much more than a body of knowledge. It is a way of knowing--a process for proposing, disposing, testing, and refining ideas. The notion that knowledge comes from experience and is subject to testing by observation and rational thought is science's most basic value--and probably its most important benefit. Thus "how do we know" dominates Chapter 1 and is the book's constant refrain. The second theme isthe significance of post-Newtonian physics. "Modern" physics (physics since 1900) reveals a universe of fields and energy structured according to relativity and quantum theory, a universe vastly different from older theories of indestructible particles in precise and predictable motion. Our culture still lives in the Newtonian age, while science has moved far beyond it. So it is important, especially for liberal-arts students, to treat modern physics in depth. Energy,the book's central physical concept, forms the third recurrent theme. 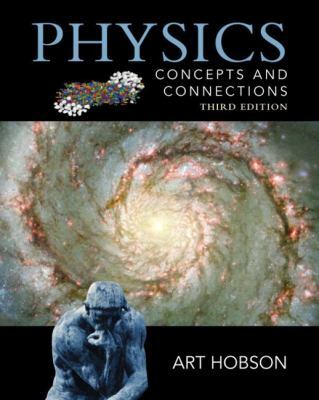 From the fall of a pebble, to nuclear processes, to the evolution of the unHobson, Art is the author of 'Physics Concepts and Connections', published 2002 under ISBN 9780130357090 and ISBN 013035709X.